Celtic design and pattern are sometimes considered classic. However, it is nowadays coming back in modern design. 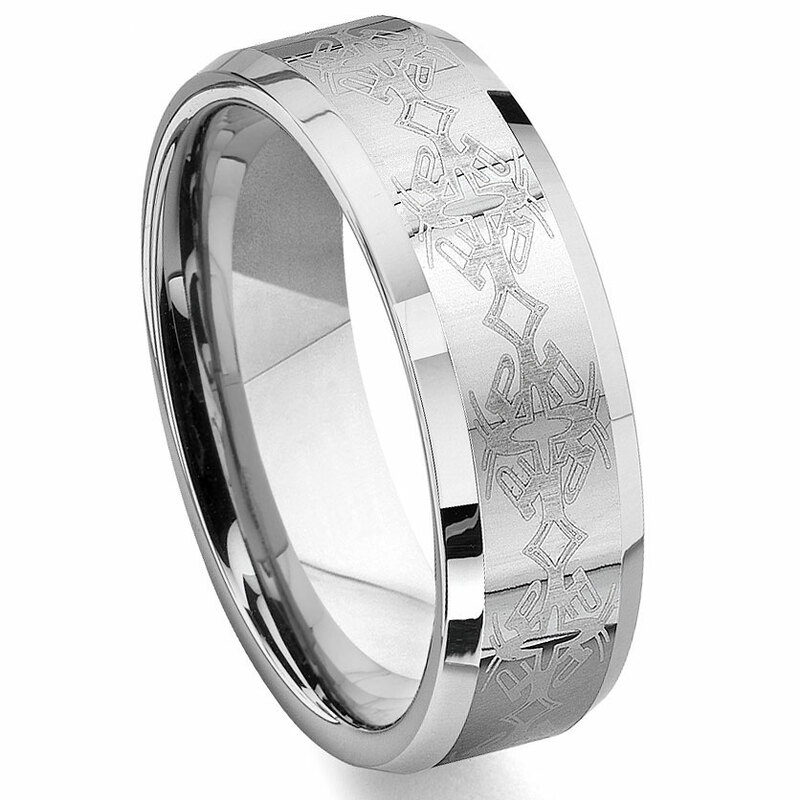 For an exclusive Irish wedding ring, you could have this tungsten ring as an option to get you a chic style. With suitable quality and style of this ring, you will wear it with full confidence. The whole ring is finished in high polish finish and it has beveled edges. It is made in 8MM width and has a comfort fit design on the inside. We got these rings for our wedding ceremony. As neither myself nor my wife like to wear rings, we had no intention of using them beyond the wedding date. However, these rings are not only beautiful, and durable, they are extremely comfortable. We haven't taken them off since the wedding and I fully expect to continue wearing mine. We got this as a replacement ring for my husband and he loves it. It's very heavy which I didn't expect and I love knowing that it is practically indestructible. My husband is very happy with it and even informed me that when we invest in new, more expensive, matching rings in the future, he will continue to wear this one on his other hand because he likes it so much. That made me happy since I was the one who found it and picked it out for him. I would definitely recommend this ring to anyone who is admiring it and is wondering whether to order it. For the money it's a great deal and we are thrilled with the quality! Hi I was not sure what to expect when going away from convention with my husband's wedding ring. To my most pleasant surprise it was a perfect decision. The ring is stunning and truly surpassed my expectations. For a man who tends to do heavy work around the home, who is more likely to take the ring off and increase the chances of losing it is the best option. For as long as he has the ring it is beautiful, clean and indestructable. If he loses it, it is cheaper to replace than a gold ring. The ring arrived very well packed and in record time. I was amazed at how quickly I received it. Thanks to all of you. My only concern is that Mark who answers the online queries could be a little more helpful. I am very happy with the ring and the service. I will continue to order from you in the future.